The Charlotte County Museum in Milltown New Brunswick has recently provided the Historical Society with some interesting photos from its collection including the one above. 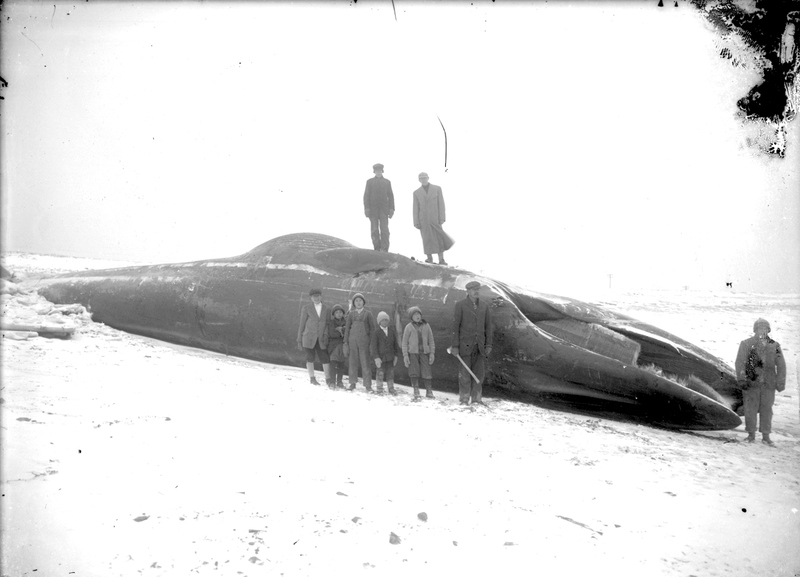 We recalled a newspaper story about Passamaquoddy whale hunters in the early 1900’s and after some research have determined this photo and one below are photos of the “monster whale” killed in 1912 by the famous tribal whale hunters Louis Mitchell and Sebat Lola. The story below from the Advertiser describes the killing of the whale by the Passamaquoddies. It was published in the Advertiser on January 24th, 1912. A monster whale made the sad mistake of venturing up the St. Croix River today and tonight its lifeless hull is anchored fore and aft with bow and stern hawsers out on Anderson’s beach, about a mile below the Indian reservation, Pleasant Point village. The whale was sighted this morning by two famous Indian whale hunters, Louis Mitchell and Sebat Lola who came down to the city (Eastport) for the biggest guns they could find and ammunition enough to crush a South American revolution. The whale seemed bent on an exploring trip and sailed up along the Eastport shore and by Carlow’s Island when he was attacked by the Indians. They put out in canoes and bombarded him with broadside after broadside, raking him fore and aft. The falling tide made difficult navigation for the whale and he soon stranded on a sandbar where the Indians completed their deadly work with spears and axes, cutting off on of his flukes so he couldn’t navigate should he come to life again. He was towed to Anderson’s Beach where he was safely moored and tomorrow will be cut up and dried out. The whale hunt created no end of excitement. The train for Pleasant Point was crowded and most of the population were in view of the finish. Some who assisted are claiming salvage on the whale although the Indians say it is theirs, for they saw him first and did most of the killing. It is said there will be objections to starting try out (sic) on the beach. The whale was the biggest ever seen or heard of in this area and as near as could be measured is fully 55 feet. The flukes spread 12 feet and it is said his blubber will yield 300 barrels of oil. The same Indians captured two small whales a few years ago in about the same place. 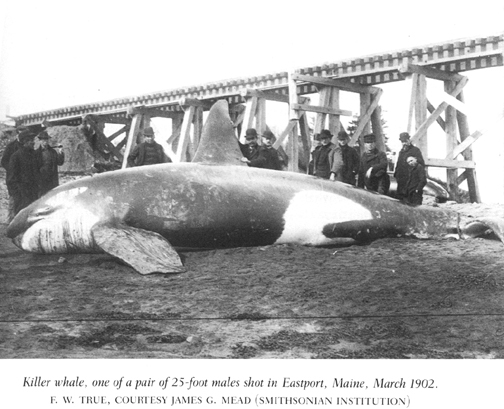 The last sentence of the article mentions the two killer whales taken by these same whale hunters in 1902. Above is a photo of one of the killer whales. For thousands of years the Passamaquoddies have hunted from their canoes in the bay. It has always been a risky enterprise for the hunters and many have surely perished in Passamaquoddy Bay. 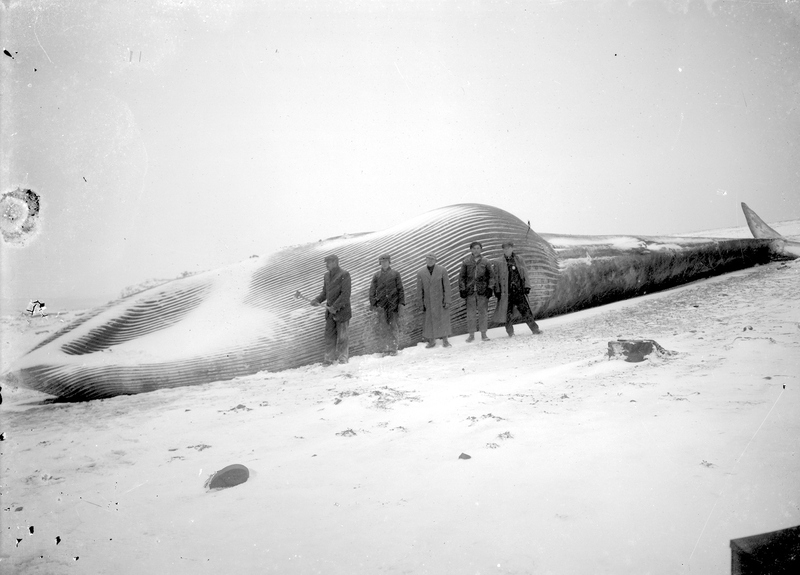 While the description of the killing of the “monster whale” may seem gruesome in this day and age, such was not the case in 1912 when no one doubted the right of Lola and Mitchell to kill the whale nor their courage in doing so from a canoe.